Cozy Chicks: Nobody wants a free copy of my book? Nobody wants a free copy of my book? Okay, the title of this post is a little misleading, so let me clarify: No LIBRARY wants a free copy of my book? Earlier this week, I sent out a newsletter to a portion of my readers. (The Booktown list.) In it, I offered a Free copy of the LARGE PRINT edition of my latest book, A Just Clause. (This edition came out in December.) My publisher was very generous and sent me more books than I need. I would like to see them go to a library. But only one library asked for it. I do have some caveats when it comes to giving away these books. They must be requested by a librarian, or a library volunteer, and they must be mailed to the library itself. Why? Too often readers have requested a book, given it to their library, and it never reaches the shelves. Instead, it goes in the Friends of the Library sale and sells for a quarter. Hey, this is a brand new, $32 book! 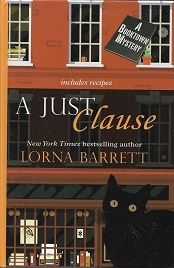 So, any libraries out there who want a copy of A Just Clause in large print? UPDATE: All the books have been spoken for. Thanks!